If you’re looking to buy silver from the United States Mint that offers variety of options and diverse designs, the America the Beautiful Series is the coin collection to seek out. The Silver Eagle is offered annually by the US Mint with the same design, but the ATB Series offers a robust 56-coin collection representing the 50 US states, the five overseas territories of the nation, and the federal district of Washington DC. 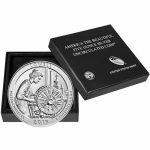 The series launched in 2010 and is slated to run through 2021, with 2019 ATB coins available representing three states and the two furthest overseas territories of the US. Learn more about the designs of 2019 ATB Silver Coins now! Which US States/Territories Feature in the 2019 ATB Designs? The release of 2019 ATB Silver Coins is unique in that it features two overseas territories of the United States in a singular release year. Known as the Commonwealth of Northern Mariana Islands, or CNMI, the 14-island chain is located in the Pacific Ocean. The southernmost island in the CNMI chain is Guam and the only one that is a separate and independent territory in itself. The two territories represented the most far-flung reaches of the United States overseas. 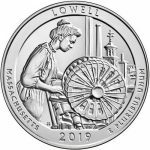 2019 Lowell National Historical Park: On the reverse design field of the 2019 Massachusetts coin in the ATB Series is the image of a woman working at a mil as she uses a power loom. The famed Boott Mill clock tower is visible out of the window in the background field. Lowell National Historical Park is located in northeastern Massachusetts and preserves several buildings within the city covering 141 acres that represent the prominent textile mills that powered the New England economy during the Industrial Revolution of the late-19th The park was established in the 1970s to preserve the buildings as the textile industry faded in prominence within the US economy. 2019 American Memorial Park: The reverse design of the 2019 Northern Mariana Islands coin in the ATB Series features the image of the Flag Circle and Court of Honor found on the island of Saipan in the CNMI. In the foreground, a young Chamorro girl looks on at the monument. This monument is unique in the series as it is considered a living monument to the sacrifices of the US Military and the local Chamorro people on Saipan during World War II. In addition to the Flag Circle and Court of Honor, the memorial park includes baseball fields, bicycling and running trails, tennis courts, space to picnic, and swimming facilities. The park is managed jointed by the government of the CNMI and the US National Park Service. 2019 War in the Pacific National Historical Park: For the reverse of the 2019 Guam coin, the ATB Series focuses on imagery of the tactics that helped the US defeat the Nazis in mainland Europe and the Japanese on countless islands in the Pacific. American forces are depicted coming ashore in an amphibious assault using Higgins boats. Guam was ceded to the United States by Spain following the Spanish-American War in 1898. The Japanese were able to overrun the island in 1941 and held onto it through 1944 before American forces successfully retook the island. 2019 San Antonio Missions National Historical Park: The 2019 Texas Coin for the ATB Series features a reverse design reflective of the colonial real issued by Spain in its North American colonies during the 15th, 16th, 17th, and 18th The design elements featured here include the arches and bell of community, the lion that symbolizes Spanish cultural heritage, the waves of the San Antonio River, and wheat representing farming. Though the Alamo is Texas’ most popular mission, it is not actually part of the San Antonio Missions National Historical Park. Instead, the park preserves four Spanish missions constructed from north to the southwest along the San Antonio River. Catholic missionaries constructed the buildings as bases for spreading the word of God and the Christian faith throughout Texas and other Spanish colonies in the area. 2019 Frank Church-River of No Return Wilderness: The 2019 Idaho coin includes design elements representing the largest contiguous federally managed landscape in the United States outside of Alaska. The protected wilderness area covers 2.367 million acres of land in Idaho and it covers areas of land that include mountain ranges and the shoreline of the Salmon River as it cuts through the center of the state. As you shop the silver for sale in the 2019 ATB Series, you’ll find there are three different choices to consider. 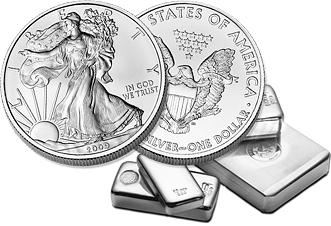 The most common option is the bullion version of the coin created for investors. The US Mint also strikes a burnished version of 2019 ATB coins with lower mintage figures and finer attention to the finish that makes the coin ideal for collectors. Both the bullion and burnished versions are struck directly by the United States Mint and offered with no mintage caps, though the bullion coins always finish with a higher mintage figure than their burnished counterparts. There also exists a colorized 2019 ATB coin for collectors and investors to buy. The United States Mint does not colorize any of its products directly. Instead, these coins are bullion versions purchased by authorized dealers and colorized aftermarket to add distinct appeal to the 2019 ATB coins. The process involves applying colorized lacquer to the design elements of the reverse field only to create a unique appearance. These coins are often extremely limited in availability as most dealers prefer to sell the majority of their bullion coins as original investment-grade options. The colorized lacquer does nothing to detract from the silver purity or quality of the coin. The 2019 ATB Coins are available to purchase in a variety of different packaging options. As the bullion coins are most likely to be purchased in multiples, this is the only coin that has several different packaging styles within one version. Bullion 2019 ATB Coins are available in individual packaging, mint tubes of 10 coins, or Monster Boxes of 100 coins that feature 10 tubes of 10 coins. Burnished 2019 ATB Coins are available from the United States Mint with a protective capsule and a US Mint commemorative display box. The burnished coins are also offered with a Certificate of Authenticity. Burnished coins are vapor-blasted after coining to create a matte finish that is visually distinct from the bullion coins. The packaging of colorized coins depends on the dealer that produces the colorization. However, most are offered in either a protective capsule or a display box to house the coin. If you have any questions about buying silver in the 2019 ATB Series, you should feel free to contact Silver.com. Our customer service team is available to you on the phone at 888-989-7223, online using our live chat service, and via our email address.